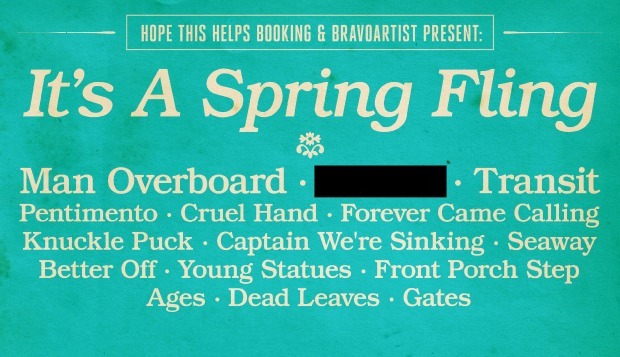 The lineup has been announced for the second annual It’s A Spring Fling… festival in Cleveland, OH, and it includes such bands as Man Overboard, Transit and Pentimento, as well as a bunch of bands from AP’s 100 Bands You Need To Know 2014 issue (Knuckle Punk, Captain We're Sinking, Better Off, Front Porch Step). The show will be held on May 23 at Beachland Ballroom and Tavern. Tickets are on sale now. Join the festival’s official Facebook event page, and check out the full list of bands below. Judging by the black bar on the flyer, it appears there will be at least one more band announced for the festival. Who do you think it could be?